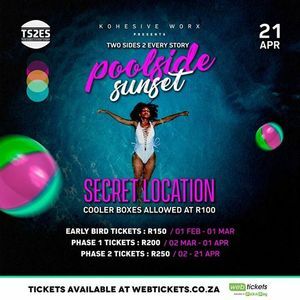 The colossal expectation and suspense for the upcoming Poolside Sunset – Easter Edition has set a task like no other in front of the accomplished Poolside Sunset team. 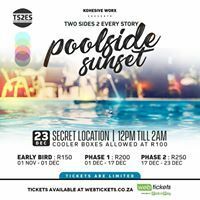 The team is planning on creating a scene unfamiliar to the devoted Poolside Sunset Lovers, a scene that oozes one’s spirit and captivates the heart and soul of every attendee. 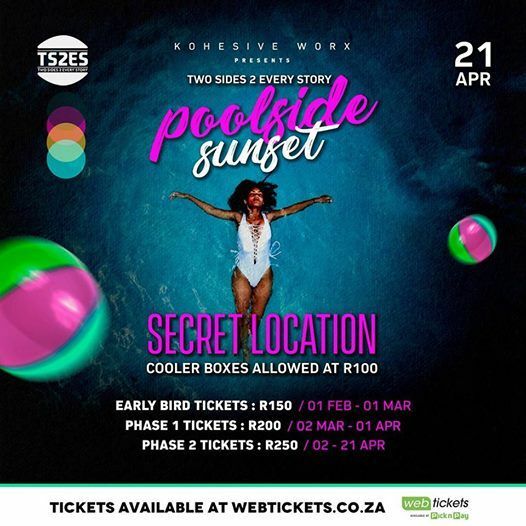 � VENUE : SECRET LOCATION - The location will be in and around Durban, South Africa and will be disclosed on the 19th of April 2019 via email and sms. Please make sure that you enter your phone number and email correctly when you purchase your ticket/s. Forget the rhythm and blues; we’re all about the rhythm and booze! !